These sturdy bases ensure the pole will not tip over. 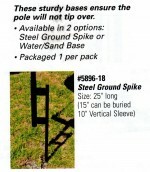 The Steel Ground Spike is 25" long overall. The lower 15" is driven into the ground, leaving a 15" sleeve above ground into which the Aluminum pole can be inserted.